But they’ve also included some real information in their annual press release. For example, Amazon’s announced their best-selling books for this year’s holiday season. And they’re also releasing a separate set of figures for the holiday best-sellers in Kindle ebooks! It’s also interesting to hear stories about Amazon’s luckiest customer, who placed an order at 2:35 on Saturday afternoon — the day before Christmas — and actually received their order on the same day, just 3 hours and 40 minutes later! They’d ordered a rechargeable pack of batteries, and they shipped it using Amazon’s “Local Express Delivery” service. It offers one-day shipping for $10 in ten different cities — or just $3.99 if you’re just purchasing a gift card. (And it’s just $3.99 to deliver any order if you’re a member of Amazon’s Prime shipping program.) Not every item is always available for one-day shipping — check its “product description” page on Amazon.com to make sure. But here’s a list of the 10 cities where Amazon’s now offering the one-day shipping option — grouped by the cut-off time for placing your orders (using their local time). Interestingly, the cut-off time for Seattle is supposed to be 1:00 p.m. But apparently the luckiest customer of the year placed their order more than 90 minutes later — and still received their batteries on the same day! And if you look carefully, you can even extract some real numbers from the rest of Amazon’s descriptive statistics. For example, “Amazon customers purchased enough sweaters to outfit each of Santa’s reindeer during Christmas Eve deliveries for the next 14,000 years.” It’s like one of those “story problems” that high school students dread in their math class. (Eight reindeer — plus one more, if you count Rudolph — would need nine sweaters for Christmas Eve, so if Amazon outfitted them for the next 14,000 years, that’d be nine times 14,000 — or 126,000 sweaters….) That doesn’t seem like a lot of sweaters, until you remember that they were all purchased online at Amazon.com. Though there’s still no way of knowing which sweaters, or how much they cost. Here’s two more “math puzzles” from Amazon — some interesting sales milestones from the great holiday shopping season of 2011. 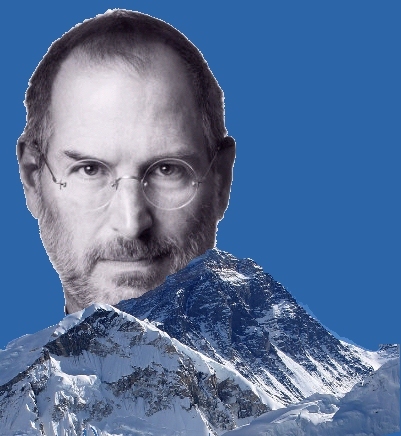 So how many ebook versions would they have to sell to reach the top of Mt. Everest?